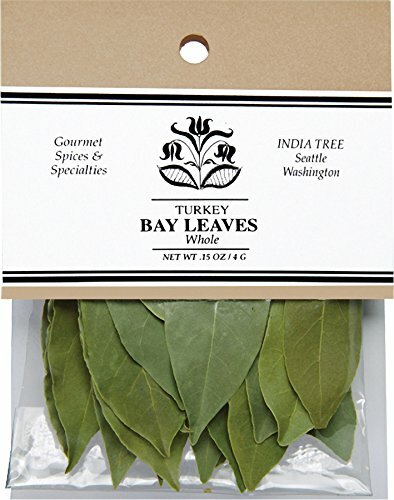 India Tree Bay Leaves, 0.15 oz (Pack of 4) by India Tree at The Flavour Stack. MPN: 20702. Hurry! Limited time offer. Offer valid only while supplies last. Bay Leaves are plucked from an evergreen tree indigenous to Asia Minor. They were used in ancient Greece to crown athletes, warriors, and poets. Bay Leaves are plucked from an evergreen tree indigenous to Asia Minor. They were used in ancient Greece to crown athletes, warriors, and poets. INDIA TREE Bay Leaves are from Turkey and are "hand selected" twice--first when they are picked from the tree, and second, when we package them for you, at which time, we select only the very best leaves. Bay Leaves are most often used in soups, stews, patés, and stuffings. Add a bay leaf to the water when poaching fish or cooking rice. Use a leaf in a marinade. Include in a classic bouquet garni--along with fresh rosemary, Italian parsley, and thyme-- to flavor soups, pot roasts, sauces and brines.